An impressive 3 in 4 California children ages 2 to 5 had a regular dental checkup in 2012, including those from poorer households, according to a new policy brief by the UCLA Center for Health Policy Research. A decade earlier, just half the children in low-income households made an annual visit to the dentist, along with 60 percent of those from higher-income households. The findings are part of a comprehensive new study that tracked young children’s health in California from 2003 to 2012. The study found gains in many areas, including health insurance coverage and dental care, but showed a drop in preschool participation, perhaps because of the associated costs. Using data from 10 years of California Health Interview Survey from 2003 to 2012, the report assessed trends in the health of young children in areas linked to health and school readiness. The report focused on Latino, white, Asian and African-American children ages 5 and younger. According to CHIS, more than 3 million children in that age range lived in the state in 2012. Much of the time period covered by the study took place during the recession from 2008 to 2012, when many families lost access to employer-funded health coverage. As more low-income families gained health coverage through two public programs — Medi-Cal and Healthy Families — ––the share of children ages 5 and younger who had private health insurance plummeted, from 57 percent in 2003 to 44 percent in 2011–12. The change meant a bigger share of young children relied on public coverage: 1 in 2 overall, compared to 1 in 3 a decade earlier. The dramatic improvements in dental care for young children during the time period may be attributable, in part, to expanded public support. 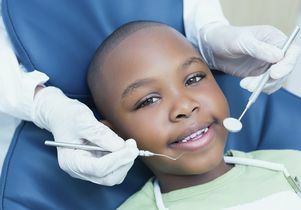 Specifically, the study notes that a $7 million grant from First 5 California, which funded the study, provided preventive dental health training and education for dental and medical providers at Women, Infant and Children and Head Start programs from 2004 to 2008, the same time period in which annual child dental visits increased. In addition, Medi-Cal and Healthy Families promoted greater awareness of dental benefits. Another bright spot: More families participated in activities that promote social skills and brain development in young children. The percentage of parents who sang or played music with their child every day rose from 64 percent in 2003 to 68 percent in 2011–12, and those who took their children out on an excursion increased from 32 percent to 37 percent. The biggest jump was in the share of parents who read to their children daily: from 53 percent in 2003 to 62 percent a decade later. However, the report found the proportion of 3- and 4-year-olds going to preschool at least 10 hours a week dropped over the decade, from 37 percent to 30 percent. More young children had access to health care. Access to health care improved for poor children as the decade progressed: the rate of uninsured poor children dropped from 13 percent in 2003 to 8.9 percent in 2012. There are disparities in the sources of medical care. In 2012, far more young Latino children (40 percent) obtained care at community clinics or public hospitals compared to white (14.6 percent) and Asian (20.1 percent) children. However, the share of white children who visited a private doctor’s office or an HMO declined 5.3 points over the decade to 82 percent. Almost all young children (97 percent) had a usual source of medical care in 2012, with two-thirds being treated by private practice doctors and HMOs and the rest at community clinics and hospitals. The report found noteworthy improvements in young children’s health over the decade — especially in closing the income gap in dental and health care. But authors say continued monitoring and further research are needed to understand what prompted negative changes in private insurance coverage and preschool enrollment.